This is Mars as it would look if it had flowing water like on Earth. Water on Mars is not possible because it is dry and cold. But based on the photographs and studies from several planetary probe data since the 1970s, Mars was most likely wet and warm in the past. The plentiful clay deposits and flow patterns left on the surface suggest that water was responsible for shaping the landscape in the past. It suggests that carbon dioxide may have been thicker and more active in creating a greenhouse effect in the Martian atmosphere just like what is happening today on Earth. What happened between then and now is a mystery. Scientists have discovered water on Mars, but it's frozen. However, there are indications of temporary flows, like what's imaged below. As for the carbon dioxide, it's now taking up 95% of the atmosphere. Yet in spite of this, it's cold. It's likely due to the fact that the atmospheric pressure is not enough to produce any significant warming effect and water vapor in the atmosphere, which also traps heat, is also largely absent. But scientists have discovered something lately which puts the theory of carbon dioxide as the cause of the warm phase of Mars, called the Noachian period, at risk. It's the fact that there are no carbonates on the surface---or at least none have been found yet. Carbonates are a byproduct of clay formation in a carbon-doxide-rich environment. Vincent Chevrier of the University of Arkansas and Jean Pierre Bibring of the University Paris-Sud say that with a thick atmosphere of carbon dioxide, there should be abundant carbonates, which is the case on Earth. 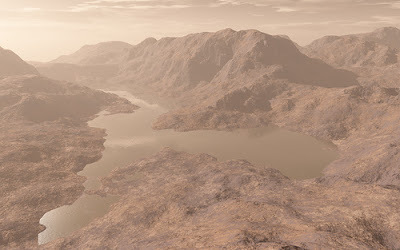 So, if the carbon dioxide in the Martian atmosphere did not cause the Noachian period, as depicted above in an artist's rendering, what did? And what caused Mars to cool up in spite of an atmosphere rich in carbon dioxide? Is it its distance from the Sun? Is it a thinning of the atmosphere? Maybe these questions will be answered as humans explore more of the Red planet. In the process, we might learn something about what's happening to the Earth's own climate and if global warming is really something serious to worry about. 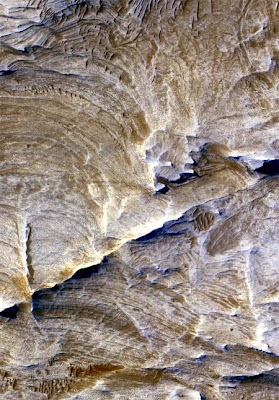 Above is a picture of a section of the Martian canyon Valles Marineris, which shows evidence of ancient "plumbing" through which may have flowed liquid water or carbon dioxide, leaving white mineral depisits. Click here for the full news. Find out how TheNewsRoom can help you promote awareness on global warming, other environmental issues, and news in general. Many have already found great content from TheNewsRoom and you can also do the same. Email jtowns@voxant.com and discover how you can make TheNewsRoom your partner in information dissemination.